…. juga akan melanjutkan pendidikan disini. Negeri Kangguru, salah satu negeri yang menawarkan kualitas pendidikan yang diatas rata-rata, sehingga setela belajar disana, kualitas layanan untuk berbagi indahnya belajar semakin diatas rata-rata, seperti tujuan pendidikan untuk meningkatkan kualitas hidup manusia. Adalaide, kota di Selatan Australia yang menawan. Kondisi kota yang tertata, pluralisme, dan kombinasi modern life and natural. Especially, i look a welcome for muslim, to gather in society and be facilitated. School of Psychology involve in Faculty of Health Science. The School of Psychology has a history dating back to 1896. 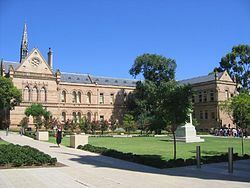 Today it is one of the six Schools of the Faculty of Health Sciences with its main location on the main North Terrace campus in the centre of Adelaide. The School also includes several teaching clinics and practices, including the Centre for the Treatment of Anxiety and Depression (CTAD) in partnership with Central Northern Adelaide Health Service and Ngartunna Wiltanendi, in collaboration with Families SA. The School offers students a range of accredited pathways for studying psychology, including the Bachelor of Psychology (Honours) and the Bachelor of Psychological Science as well as three professional master programs, a Graduate Diploma in Psychological Sciences, and the PhD program. All members of academic staff are research active, with the School’s major strengths in the areas of health and clinical psychology, cognition and brain, and social and organisational psychology. The School of Psychology Master of Psychology (Clinical) degree program consists of three major components: coursework, research thesis and field placements. The program involves two years full-time or four years part-time study. The aim of this program is to provide graduates with the tertiary-level education required to be eligible for registration as a Psychologist and eligibility for membership of the Australian Psychological Society’s (APS) College of Clinical Psychologists. The APS College of Clinical Psychologists defines clinical psychology as “a specialist branch of psychology which is concerned with the development, prevention and treatment of emotional problems in children, adolescents and adults. A distinguishing feature of clinical psychology is its focus on scientific training, clinical practice and research with persons disabled by psychological problems including those with the most severe mental disorders.” The approved model for training is the “scientist-practitioner” model, which means maintaining a scholarly and critical approach to the scientific evidence-base of the profession, and to the evaluation of one’s own practice, as well as contributing to the further development of scientific clinical psychology and staying up to date with the contributions of others. The program has two key objectives. The first is to provide thorough theoretical and clinical skills preparation in core areas to meet formal requirements for entry to the profession (as determined by its accrediting bodies). The second is to prepare graduates to accept responsibility for continual self-monitoring and development after graduation, skills that are essential to ongoing professional practice. The program is available to graduates with an Honours degree in Psychology. Selection procedures depend on academic results, referee reports and a structured interview. The South Australian Psychological Board recognises the program as equivalent to the two year supervision requirement for registration purposes under the proclaimed Psychological Practices Act, 1973. Currently the program has accreditation for entry to the APS and approval from the APS College of Clinical Psychologists, and the South Australian Psychological Board recognises the program as equivalent to the two year supervision requirement for registration purposes under the proclaimed Psychological Practices Act, 1973. The School undergoes regular accreditation by APAC, the national psychology accreditation body, which specifies the curriculum and training methods for programs such as this throughout Australia. The APAC Accreditation Standards and CCP Guidelines are available at APAC. To assist the program to maintain credibility and relevance by reflecting theoretical and practical developments in psychology and serving students responsibly, a Masters External Advisory Committee (MAC) advises the School on relevant issues. Membership includes practising psychologists on the Register of the South Australian Psychological Board, one or more currently enrolled students, and a graduate, as well as School representation and a member of the tenured academic staff from a cognate School. There is also an internal Master’s Committee consisting of the School members with major teaching roles in this degree program. The program commences in late January of the first year of study. It is very demanding, and some coursework, practical placement and research requirements are undertaken outside the Semesters, during periods regarded as vacations for undergraduate students. Full-time students must be available from 9am to 5pm Monday to Friday (and part-time students for the half-time equivalent) and they must arrange any other commitments to fit in with scheduled courses, research and placements. It is not feasible to undertake much employment during your candidature, or to take more than 4 weeks’ leave per year. It is very important that you note this because the program must be completed within four years from commencement. In the normal pattern of study, students enrolled on a full-time basis will complete seven courses of study and one placement, during first year. They should also do preliminary work on their research project although they will not enrol formally for this until second year. During second year they will complete two further placements, and the research project. Students may wish to consider linking the research project to one of the placements. it’s more interesting with it…. The Centre for Treatment of Anxiety and Depression (CTAD) is a joint initiative between the Faculty of Health Science’s School of Psychology at the University of Adelaide and the Central Northern Adelaide Health Service. The Centre’s main focus will be treating patients suffering anxiety and depression using a method known as Cognitive Behavioural Therapy. This therapy lasts between 8 to 12 weeks, and has produced significant empirical evidence of success in the treatment of anxiety and depression. I like to take a topic about this for my thesis….